If you never got invited to the cool kids’ 10th birthday parties, now’s your chance, because the coolest kids in school are inviting you. Two of Australia’s – nay, the world’s – most impressive and zaniest acts have announced a co-headlining 10th anniversary tour of Australia this July. 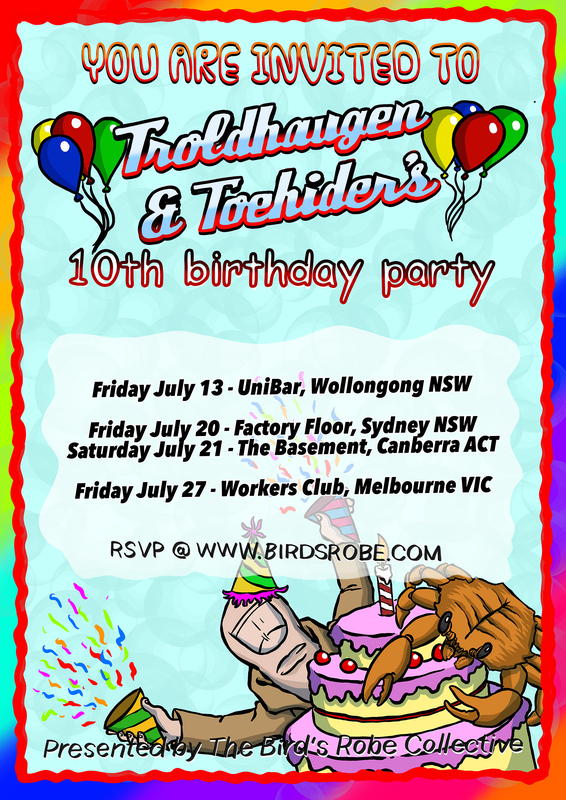 Both formed in 2008, the Melbourne’s TOEHIDER and Wollongong-based troupe TROLDHAUGEN have built a fast friendship over the years (including a co-headlining tour back in 2014) and are heading out on the road together to put on one heck of a birthday party. For anyone who knows these acts, this is going to be one huge, unmissable night of awesomeness. Expect plenty of big riffs, big vocals, prog quirkiness and loads of unpredictability. If you’re not familiar, read on. TOEHIDER burst onto the scene in 2008 as the brainchild of multi-instrumentalist and vocalist Mike Mills, in collaboration with graphic artist Andrew ‘Salty’ Saltmarsh. Kicking off in style, Toehider released 12 EPs in 12 months, spanning a multitude of genres from progressive rock, pop, folk, metal, Christmas tunes and even an original children’s story audio book. The prolific quality of Toehider promptly earned a cult following which sparked the formation of a live touring band to take the project on the road for a series of Progfest shows and club dates. Since then, Toehider have been invited to tour with DEVIN TOWNSEND (CAN), THE PROTOMEN (USA), THE BEARDS, VOYAGER & CALIGULA’S HORSE, as well as sharing stages with TWELVE FOOT NINJA, SLEEPMAKESWAVES & CLOSURE IN MOSCOW. 2016 saw the released of a new EP ‘Mainly Songs about Robots’ featuring the drumming of the iconic Vinnie Appice; and also an amicable farewell to long-time live band members Lachlan Barclay, Amy Campbell and Mike Solo as the band shifted to a power trio format. This year, Mills heads to Europe to perform with Ayreon at GRASPOP, one of Europe’s biggest festivals. This 10th anniversary will be a homecoming in style for Australia’s most prolific progressive rock artist. “I’m absolutely thrilled to be getting out and doing some shows to celebrate this momentous occasion! I still remember recording the first album on a Pentium 4 PC that would always crash…I’d send Salty a small portion of a song, and he’d respond by drawing all this wild and crazy stuff. Who knew we’d still be doing it 10 years later? TROLDHAUGEN initially formed in 2008 as a folk-prog-metal five-piece. Their quirky ramshackle tunes found a local following and spawned the released of a cover of ABBA’s ‘Gimme Gimme Gimme (a troll after midnight).’ Soon afterwards, the band shed a member and any genre descriptions by morphing into an incredible mash of styles. Their 2013 full-length album ‘Obkzure Anekdotez for Maniakal Massez’ was supported by a successful crowdfunding campaign and saw them earn multiple triple j spins for its tracks ‘Via Loa Vegas’ and ‘Dia del Chupacabra.’ They also toured nationally alongside ALESTORM (UK), VAMPILLIA (JPN), TOEHIDER and supported FINNTROLL, KORPIKLAANI & TWELVE FOOT NINJA. 2014 also saw their first European tour supporting ALESTORM, whom they toured with again in 2015, before wrapping up the year as one of the headliner’s at the Bird’s Robe Record’s 5th birthday celebrations at Sydney’s Manning Bar. In 2017, the band re-emerged with a brand new album “IDIO(T)SYNCRASIES” and an even more powerful live show. Touring with TWELVE FOOT NINJA, TROLLFEST, sold out headline shows and another full European tour with as direct support for pirate-metal legends ALESTORM followed, as well as airplay for ‘BMX Terminator’ on triple j. This lineup really, really…takes the cake.